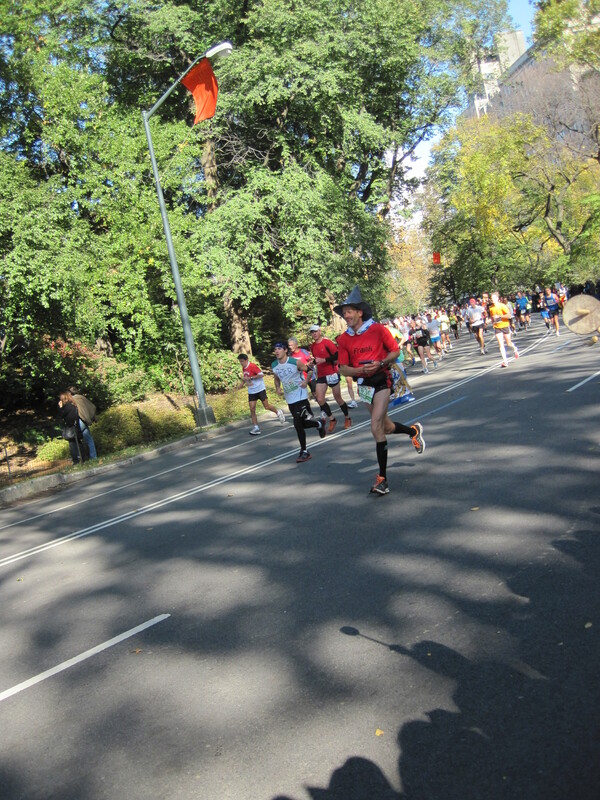 Sunday’s race was in honor and remembrance of Fred Lebow’s passing, who was a co-founder of the New York City Marathon. The course description is loosely as such – “Van Cortlandt Park’s famed running trails – dart up cinder hills, cruise along grassy flats, and hear the crunch of fallen leaves beneath your feet over 5K of rugged terrain.” Santiago, Matt, and I dabbled with the idea of going to check out the course the previous weekend, as Santiago was the only one who’d ever been there, but we ran out of time and we had him tell us about it. He remembered there were some hills. 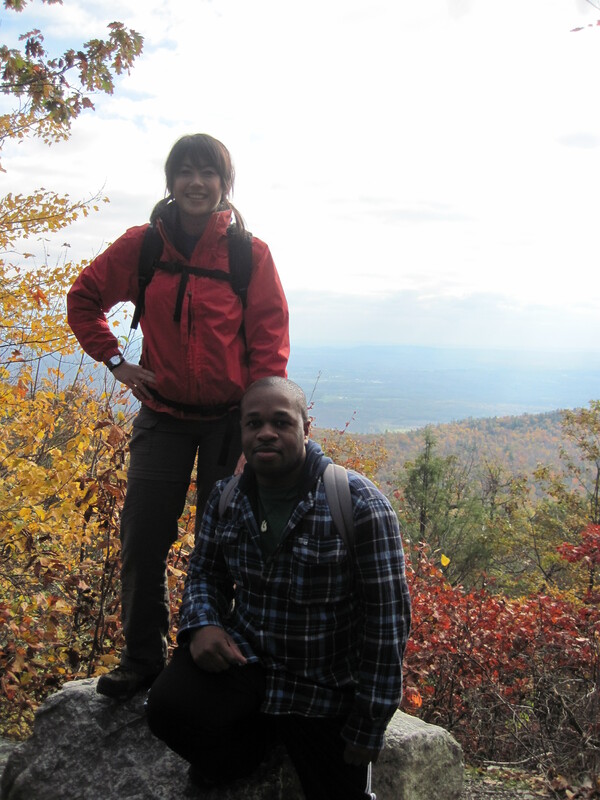 And the photo on the internet was of a slight incline at the beginning of the woods portion. 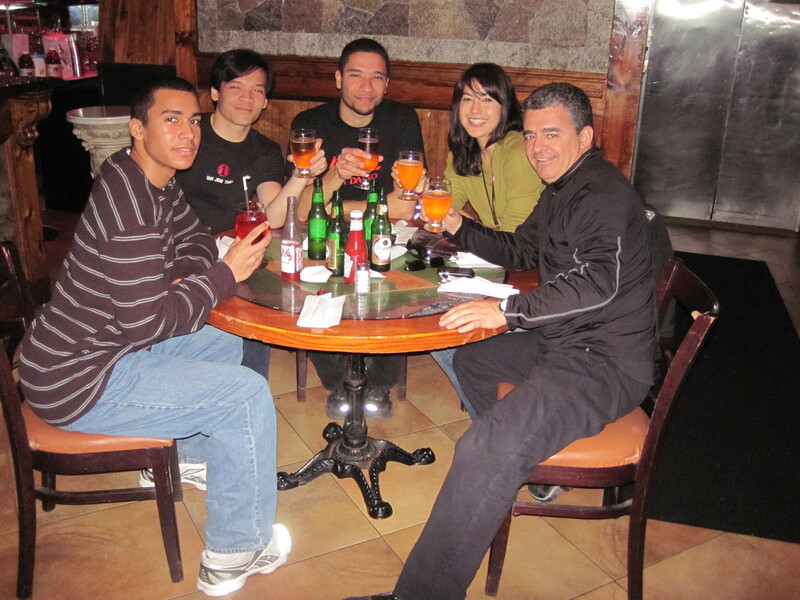 Continuing from the day before, our group met up with Fernando at around 10:30am. We had about an hour to register and warm up. I looked around and saw a huge field and a path up to some woods. One racer told us there were steps. I began to get a bit jittery (this time it wasn’t the GU) and did 2 strides with Santiago. He had an elaborate plan on how to make it through but after the strides, I found that I was either going to have to do my own thing, or jump on his back, ride him about 2K, jump off, kick him in the shin, and sprint to the end. Alas, I picked Option 1. 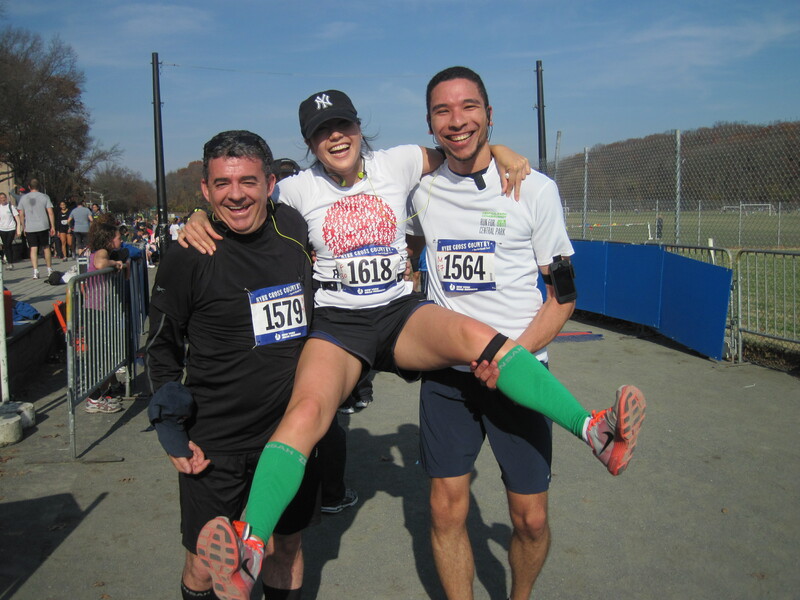 We stretched a bit, got in the port-a-potty line, drank the last bit of water, and went to the start line. And…the start line was a spray painted blue line across the grass field. What? Where is the technology that starts our D-tag? What’s that guy with the megaphone saying? We were all fussing about – me, I was trying to put on my nano – and wondering how the hell this was going to work when *CRACK! * A gun goes off and Santiago yells “Oh crap, it started!” (Not sure about the ‘crap’ part.) Everyone started running frantically and I just panicked and ran without saying anything to my group. Santiago was already yards ahead. I was still trying to set my GPS watch and of course, my compression sock decides it’s going to sag around my ankle for the first time ever. Gah!!! What a start to my first cross country! The Field: There I was, booking it across a field with a ton of other people. It was utter chaos. I was watching the ground with one eye so I wouldn’t break my ankle in a hole, and watched the other runners for an opening to get ahead with the other. I only had 5K to establish a good placing so I tried my best to get with a decent paced group. After the field, we rounded the corner onto a dirt ‘track’ so-to-speak, and it got narrow. I think I was in an ok grouping; turns out the mass start ends up with natural corralling of paces (but no horsies). The Woods: After we looped back to where we started, it was up into the woods. Here was the incline I saw in the photo. Here were the steps that guy was talking about. It was pretty, with leaves and roots and logs everywhere. It was hard going up but doable. Cross country, this is what it’s all about. The Back Hills: Through the woods I went. I was kind of losing some steam since there wasn’t much of an end to the incline. Finally, I passed over a highway overpass, and ended up back into the woods. This portion was called the Back Hills. But, I already ran through a hill. Apparently, I hadn’t seen anything yet. This is what I named post-race the “stairway to heaven.” It was just up and up and UP. More narrow, more steps, more steep. A lot of people had to stop running and start walking. It was practically impossible to keep any semblance of ‘running.’ I huffed and puffed with the hope that the next turn would lead to the downhill portion. I was disappointed over and over again. I could barely breathe and my legs were killing me. 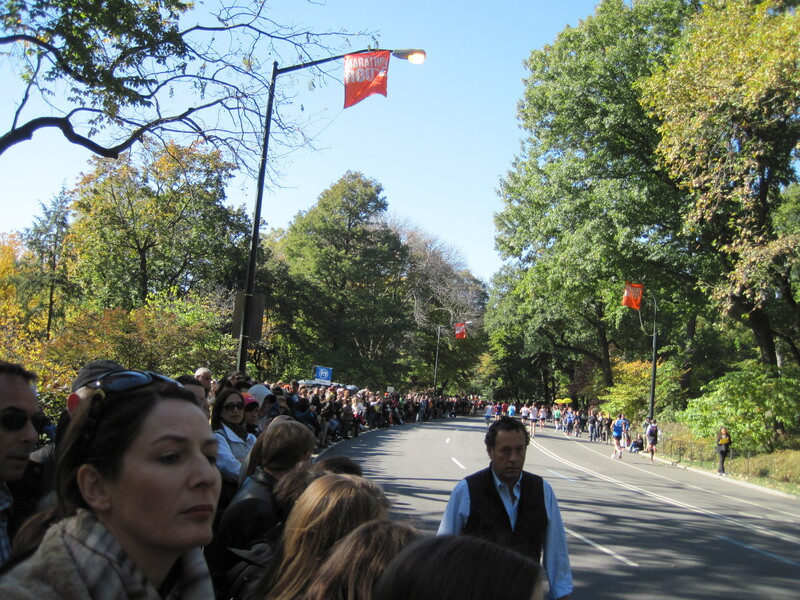 Once I looked up ahead and saw the runners ahead of me about 10 feet higher in elevation. I am pretty sure my eyeballs bugged out and my spleen fell out, but I ground down and chugged on. 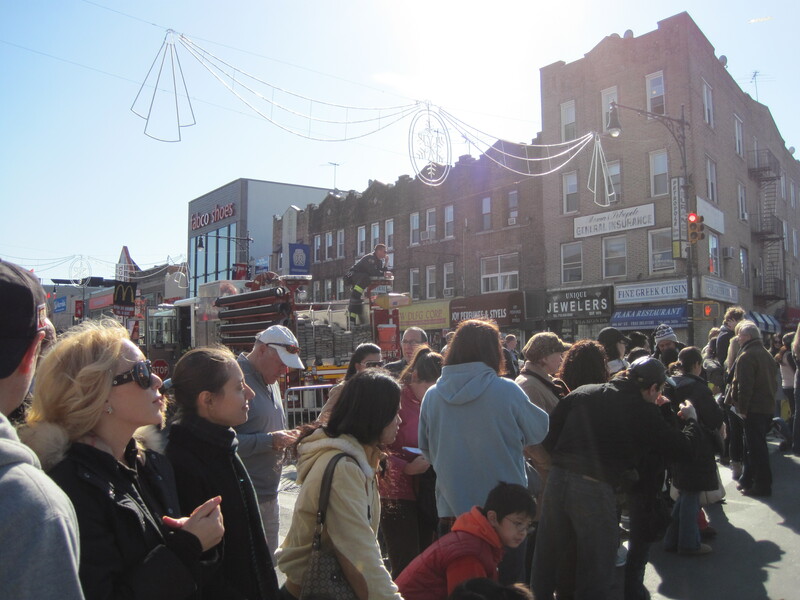 I was SO tempted to stop and walk, as more and more people did. But I couldn’t. Walking was not what all the early morning intervals were for. I knew I would be pissed if I gave in to the temptation not because it was a bad thing to do, because it wasn’t, but because it simply was a temptation and giving in would make me feel mentally weak when all my training was supposed to make me mentally strong. I berated myself for thinking it, prided myself in not doing it, and encouraged myself by thinking how it would all be over soon enough if I just kept at it. I honestly don’t think I was going faster than walking, but I was still making the ‘running’ motion and for me, that was damn well good enough. The Final Stretch: Back across the overpass, there was one more downhill which was not very steep and just pure delight. I thought, “It’s over very soon!” I even spied Santiago up ahead! I rounded the corner to face the field and — WTF. Where was the finish line? Around another bend, I could see the red tent WAY FAR AHEAD. I was not almost done. I was Almost Almost Done. Crap. I kept going, thinking maybe I’d speed up since it was flat, but I soon found I had little to nothing left. I just tried not to slow down. I tried to reel in Santiago in bursts. But apparently he spied me behind him and he also started running faster. Down the final straightaway, I stopped looking for Santiago and just gave the last of my life to trying to make a decent finish. The Finish Line: And it was a decent finish! Followed by stumbling past Santiago who was doubled over, clinging to the wire fence and gasping for breath before succumbing to my knees myself. Santiago finally said “Let’s sit!” and I said “Water!” and he went to sit and I grabbed us water. 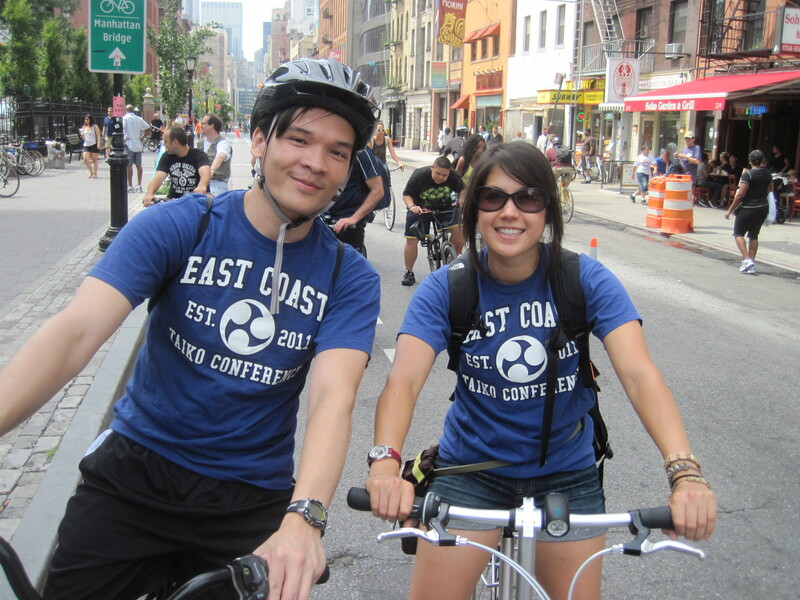 Once we finally could breathe properly, we smiled and congratulated each other. We did it! And it appeared like we both may have made under 25 minutes!!! 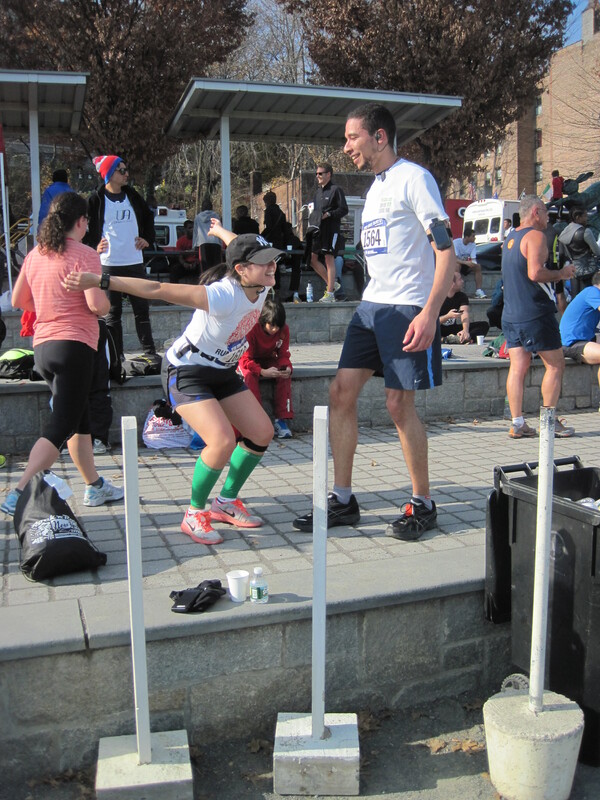 Next across the finish line was Santiago’s brother (he finished strong, in a full sprint, it was amazing! 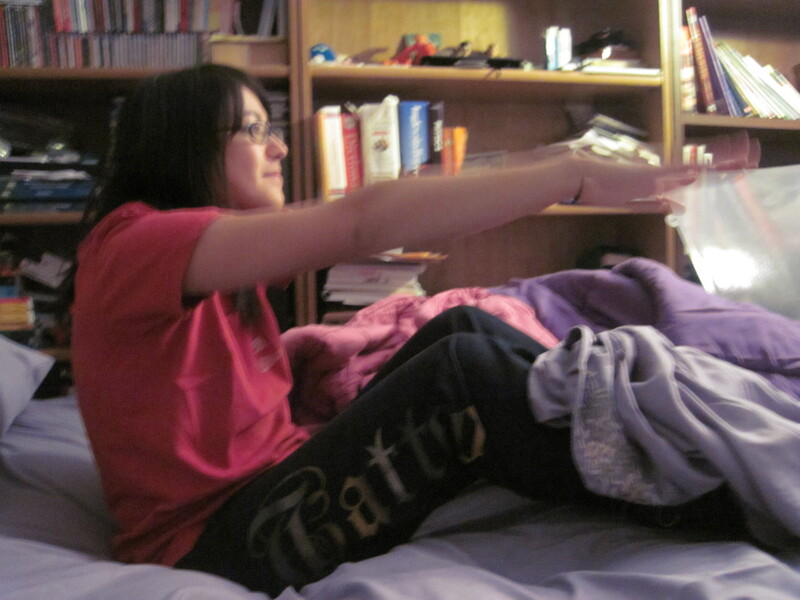 ), and Santiago left me to go congratulate him. I waited before the finish line and had the great pleasure of cheering both Fernando and Matt down the final 10 meters. Both of them were smiling and happy. I am so proud of them. What a difference in their expressions from Santiago and my finish-face! There was nothing fancy at the end of the race. There was no beer, no t-shirt, no bagels, no apples, no award ceremony. But there was a lot of pride. We all did it. We faced adversity, we faced near-death, but we made it through, injury-free, up the stairs to heaven, down head on to Cemetery Hill, and across the finish line. And now I know what “cross country” means. I had thought that it meant ‘not on the road.’ But it means something more than that. It means you will be surrounded by nature and the sound of your struggling breath. It means you will face an intense physical challenge coupled with a psychological challenge. It means that you will be as traumatized as you will be excited. It means you will be damn hungry afterwards. At the end of it all, I am extremely happy that we did not check the course ahead of time. I would have been scared to run fast to preserve my energy, and I would definitely have been slower. I do wish that we knew what the heck was going on before the race started. With the hindsight of my GPS recording, I ran off in a total panic and started off WAY too fast. Actually, I ended up running the fastest mile I have ever run for the 1st mile of the race (not withstanding the hurricane 1 mile record). That is not a good way to start a race longer than 1 mile. I also know that I was 100% out of steam by the end. I had nothing left to give to the race. There was no glorious sprint finish despite the fact that it was flat at the end. I was literally running on empty and did all I could do. Next time, I will know better what to expect for such types of racing and will plan better. And maybe actually beat Papi’s 5K time. Because right now, we’re TIED. 24 minutes, 47 seconds exactly. FBa, Blackfoot, and Santiago (and Matt and Santiago's Bro): The Victorious!!! The word PREPARATION is a bit misleading. There was actually nothing that prepared me for this 5K. 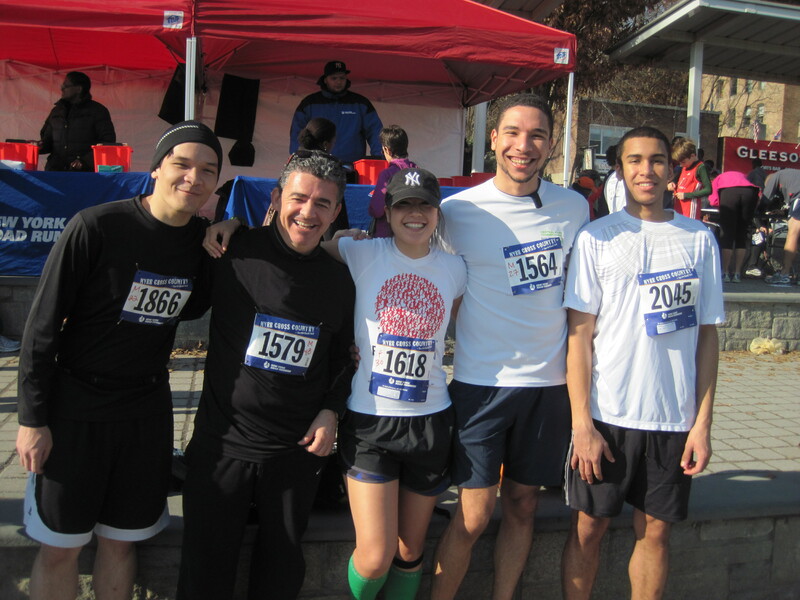 Last Sunday, I completed my first official 5K race. I had been preparing for this for 3 weeks, after the Poland Spring 5M race which was cancelled. “Preparation” meant running 6 days a week (with taiko as my cross training), intervals every Tuesday and Thursday, and my Long Runs being 7-8 miles at a relaxed pace. This was going to be shortest race distance I have ever done, so I was planning on trying to get used to getting my speed up, keeping it up, feeling the burn and the pain, and dealing with it to the extent that I’d finish under 25 minutes. In theory, this was a great plan and I was excited and ready to have FUN. The weekend approached and everything was coming together. Saturday started with an little-more-intense-than-helpful taiko practice, which left Matt and I pretty sore that night (and race day). 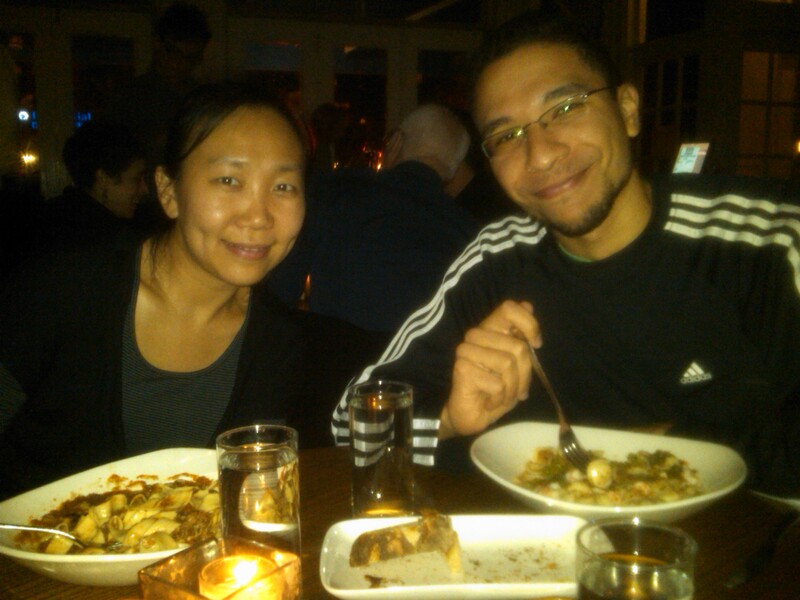 After practice we met up with Santiago and Sharon for some carbs. I know it’s not necessary for a 5K but it couldn’t hurt, right? Then Santiago busted out with a great apple crumble which not only satisfied my sweet tooth but also made me the Mario Kart Master. Apple crumble and Wii games make pre-race night fun! Then there was the trek up to the Bronx. 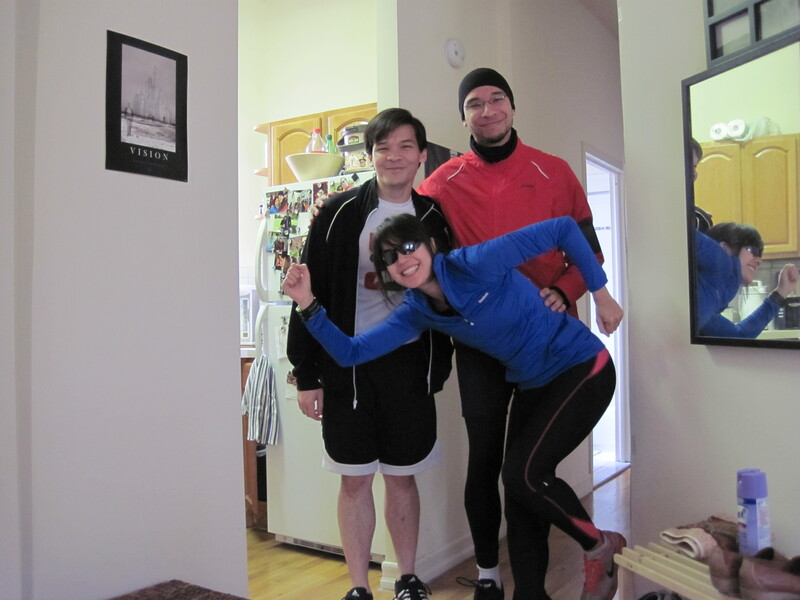 Santiago’s super sweet mom let us crash up at her place which is near Van Cortland Park, the race venue. We left a little later than expected (damn us gamers, we just don’t know when to quit!) and our trek up was indeed a trek, but no cab needed, thankfully. Just some late night subway riding and a shuttle bus full of scary over-made-up unattractive ladies. 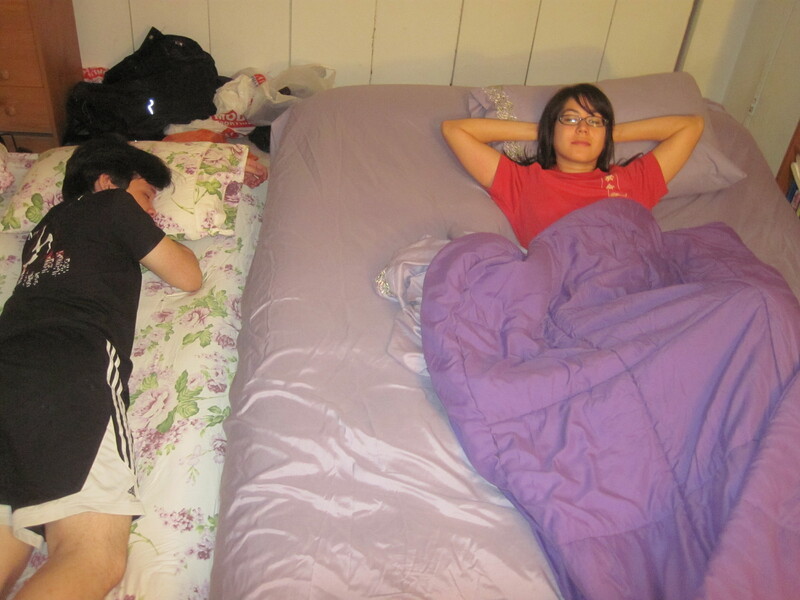 We got to the apartment a bit past midnight and set ourselves up with some fancy and fantastic air beds. This was the most luxurious sleepover I have had in a long time! No sleeping bag required, no 7 people to a room, no snoring! After some late night gossip, we fell asleep innocently anticipating our ‘fun’ 5K! The next morning we woke up well rested and ready for more carbs. I was so hungry! I ate a bagel and would have eaten some cookies if Santiago hadn’t stopped me. We set off with Santiago’s brother who also decided to race and met Fernando at the race registration. And then the fun REALLY began…………. With one week before my first 5K, I remember my first ‘long run’ of the year! 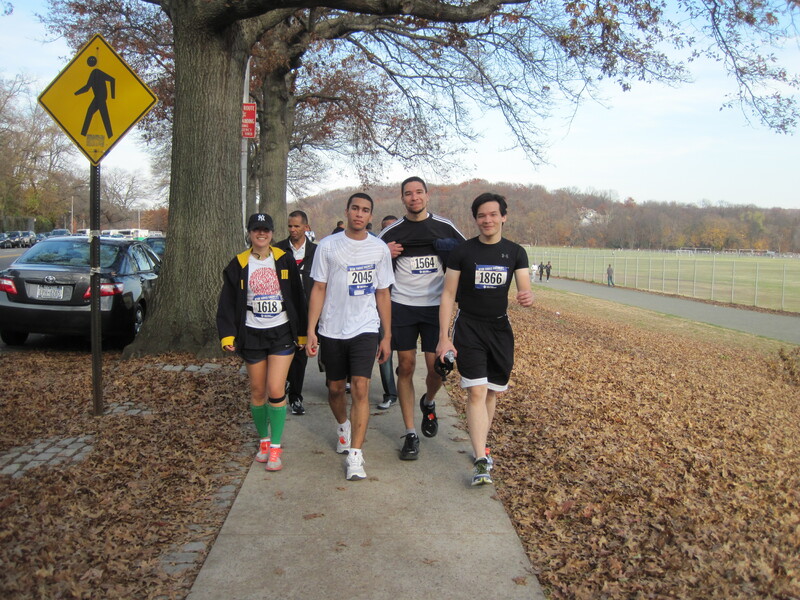 This morning, my fellow running mate Santiago and new running mate Matt met up for a long run. 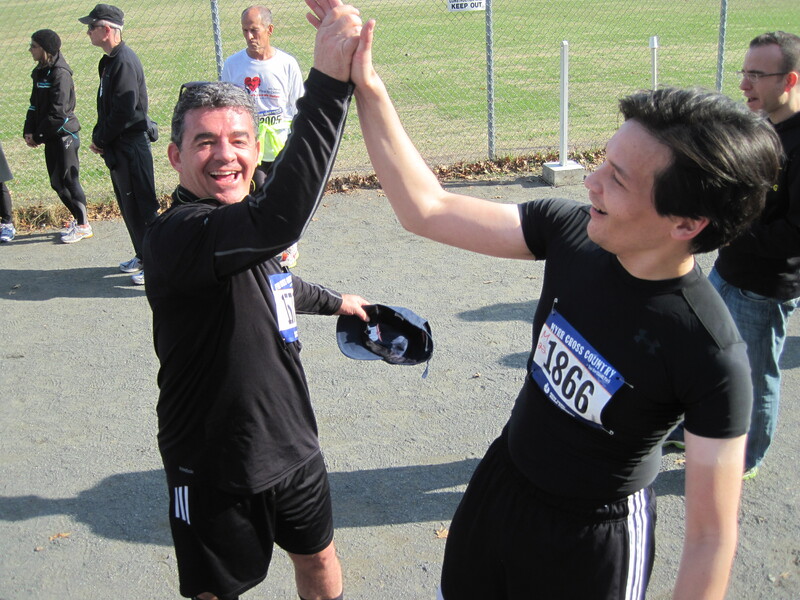 Santiago and I have been running some long runs together periodically, and, as a primarily solo runner, he is the person I have most frequently run with. It all started after the terrible Great East Japan Earthquake and other disasters that occurred this year on March 11th. 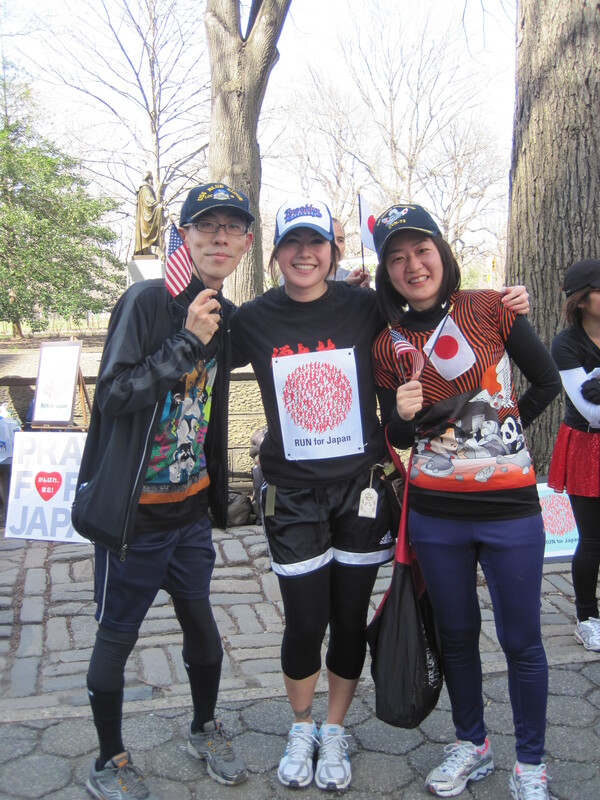 Ayako and her running club decided to have a RUN for Japan, where participants would run or walk the outer loop of Central Park (6 miles) and raise money prior to the run to donate to the people of Tohoku. 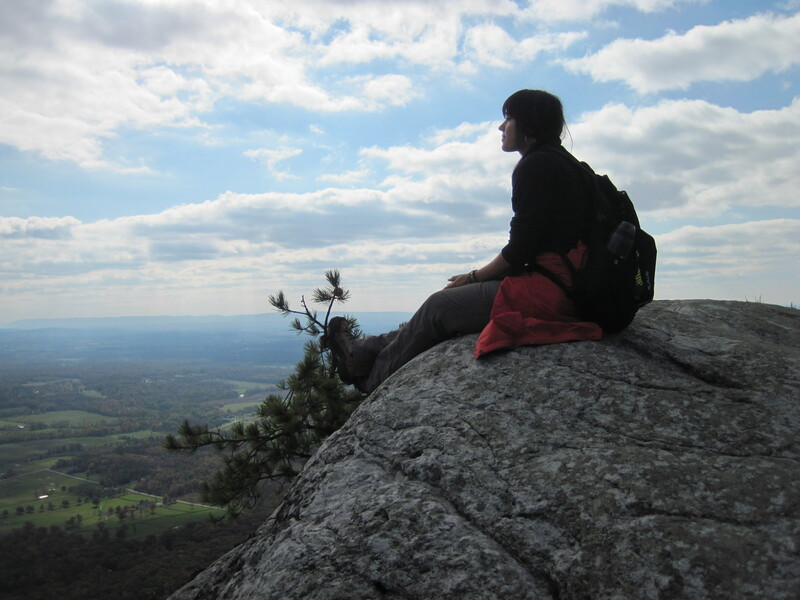 I raised about $600 – a sum that I appreciated very much from my friends and colleagues. But then I definitely had to run the whole 6 miles, which was a distance I had never gone before. Ayako, Santiago, Blackfoot and Junko! I also hadn’t run much at all this year. 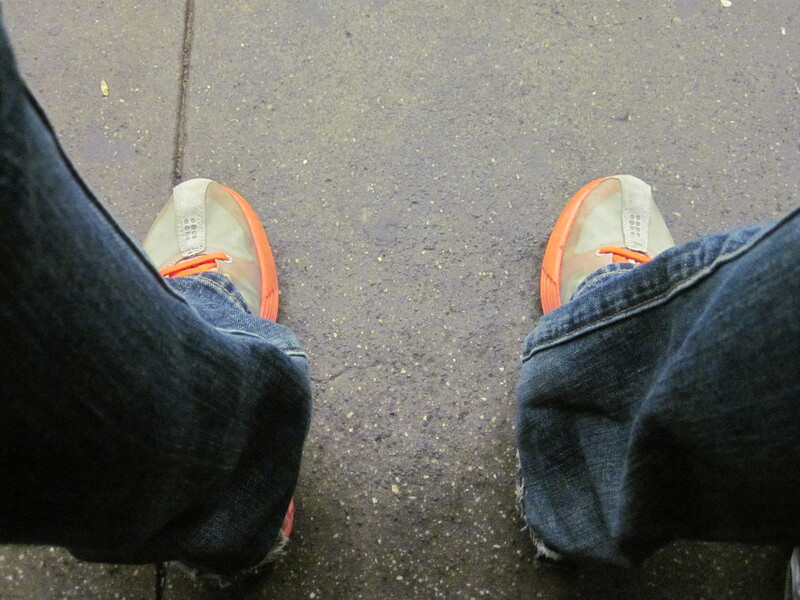 It was April 2011 and I really hadn’t done much running besides some gym stints. And last year was my “bust” year, as I ran a lot for weeks, tore something in my ankle, kept running like an idiot, ran a freakin’ race on the busted ankle, further busting it, followed by 2 hours of taiko playing….well, let’s just say I was just coming off my hiatus after a summer on crutches followed by a winter with pneumonia. 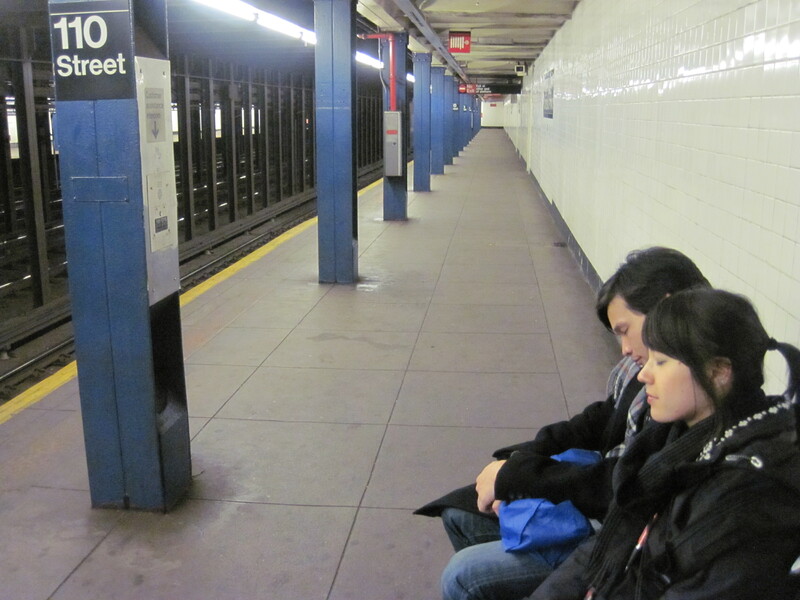 Back to April of this year: Santiago, Junko, and I met up at Central Park freezing. 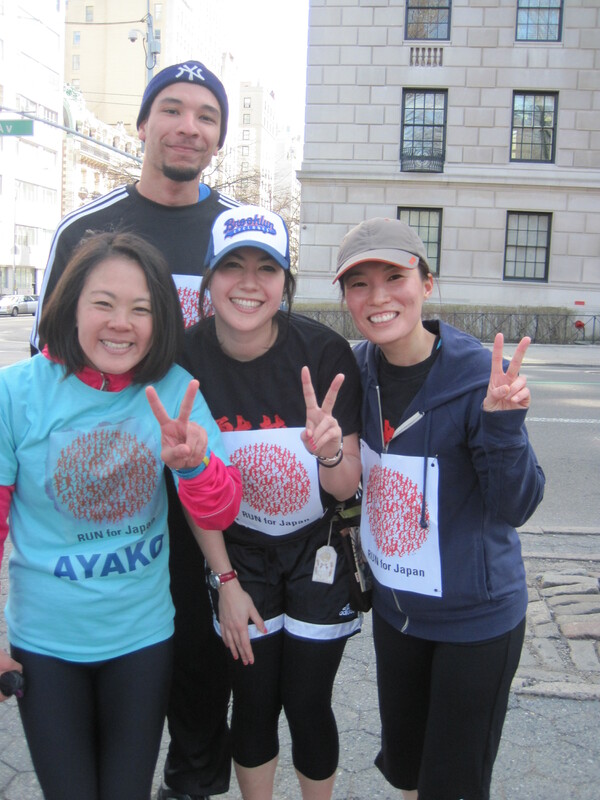 We gave in our money to Ayako, the main organizer and one of the most awesome runners ever – she did the run 3 times! – and prepared ourselves for the longest run any of us had ever had to do. 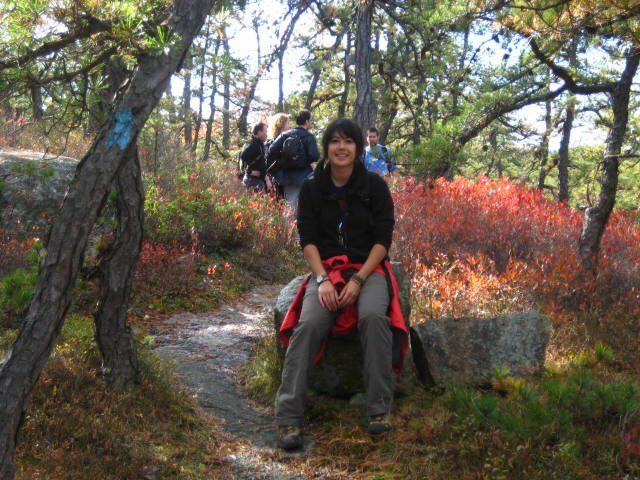 Junko’s plan was to run the first 2 miles and take a walking break. 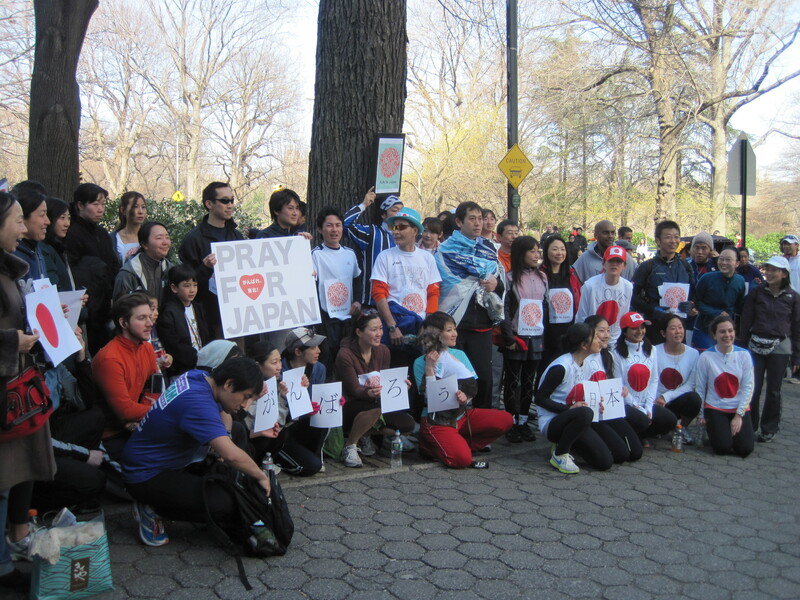 But after 2 miles, which, between the catching up we were doing and talking about the events in Japan, flew by, we decided that for the people of Tohoku who were suffering every day, we could suffer more too by keeping going and not stopping. Guess what! We did it! We made it the whole way without stopping. We were so elated at the end. With little to no training, we made it through, injury free and with a lot of pride that we accomplished the long run for a wonderful cause. I also saw one of my colleagues from my office was there with his wife! That was the beginning of this year’s serious running. I knew I could do it and I would do it right. I bought a book on running for women and made sure to do the right things not to get injured and build up mileage properly. 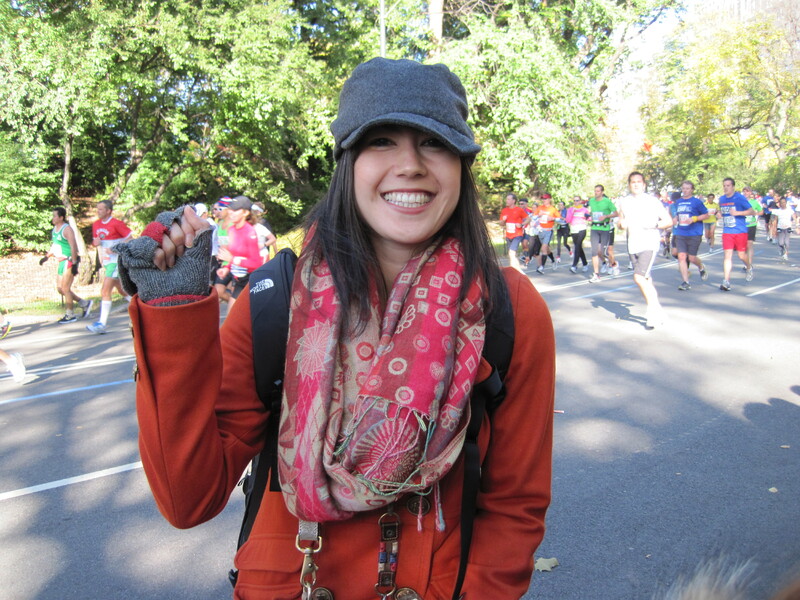 It was one of the best decisions I ever made, because here I am, running 8 miles no problem, chatting with friends, making great connections, and improving my life. 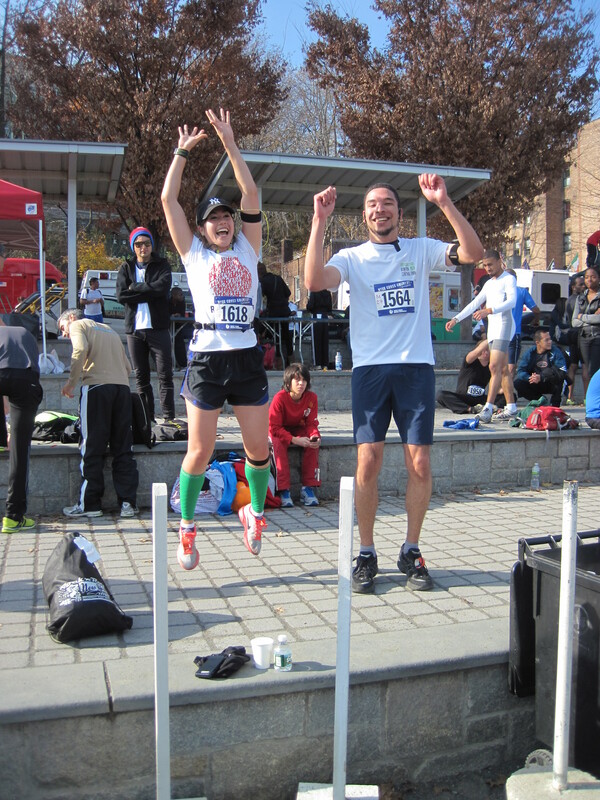 A shout out is due to Ayako for keeping up with RUN for Japan – on December 4th, the fifth RUN will be held again in Central Park (I won’t be able to go since I will be in Paraguay but I encourage you all to go if you are in NYC). 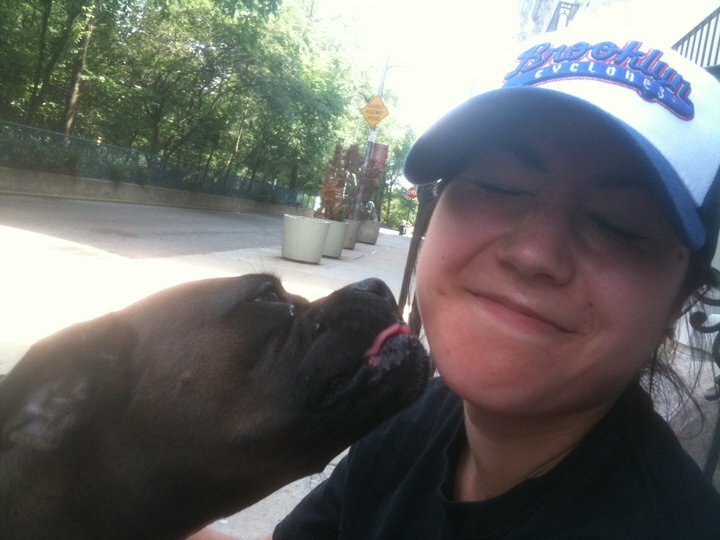 Since then, Santiago and I have done an 8.5 mile run from the Brooklyn side of the Brooklyn Bridge and up the west side, ending at the dojo we first met, and then I subsequently got snogged by a dog. 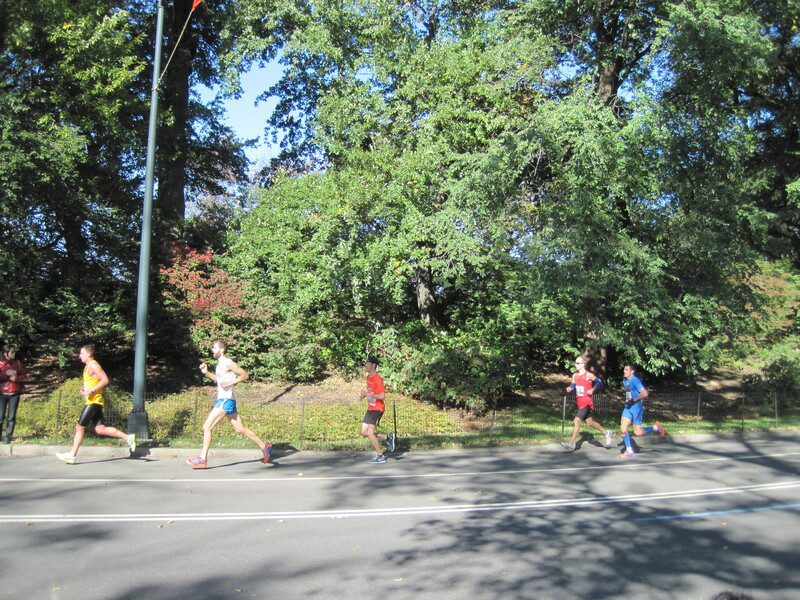 We also ran through the streets of Manhattan from the same starting point, up 5th Ave, ending at the tippy top of Central Park during NYC’s Summer Series where they close a bunch of streets so that us New Yorkers could have free reign to run and bike. And bike we did, the following weekend. 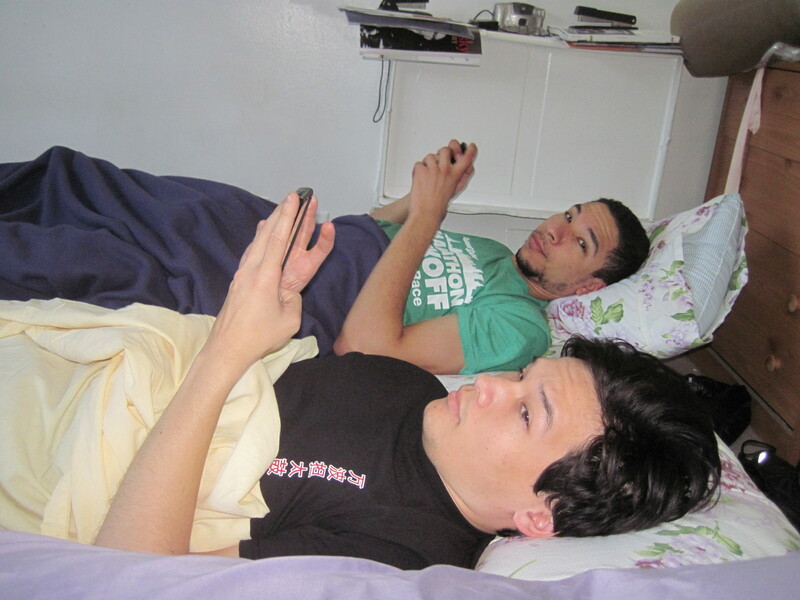 Now, Matt and Santiago are partying with Yuta and I got sorta stuck at home doing my laundry. But, I did accomplish my long run today which was super fun. Thanks guys! Drink a beer for me, or maybe I’ll hunt you down and drink it myself later! 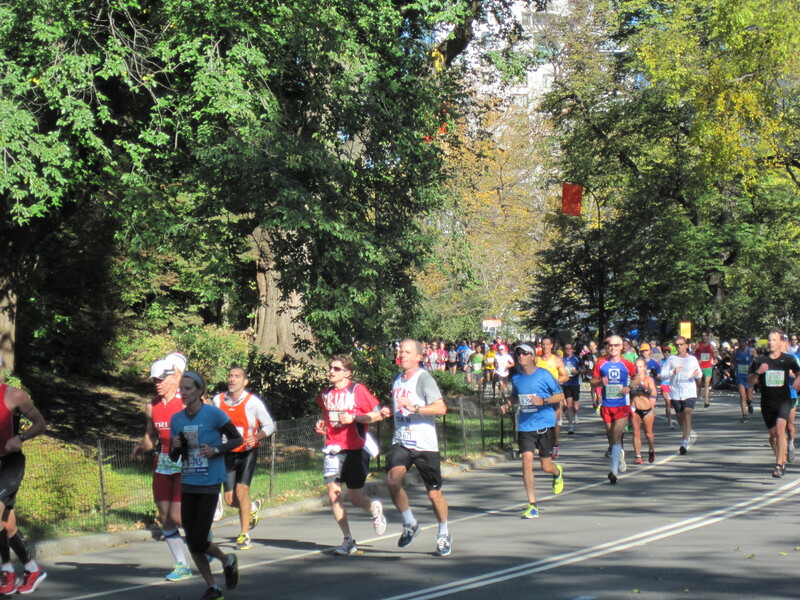 There is nothing more inspiring for a runner than the NYC Marathon. I had been having trouble with my daily 5:30am wake up and run. I had been literally dragging my feet. After non-stop training from the 10K to the 5M which was cancelled, and now the 5K coming up on November 20th, I think I was getting burnt out. It was a gorgeous day and though I felt a bit tired, I got my run done and headed up to Central Park where I found a cozy spot near Mile 24. 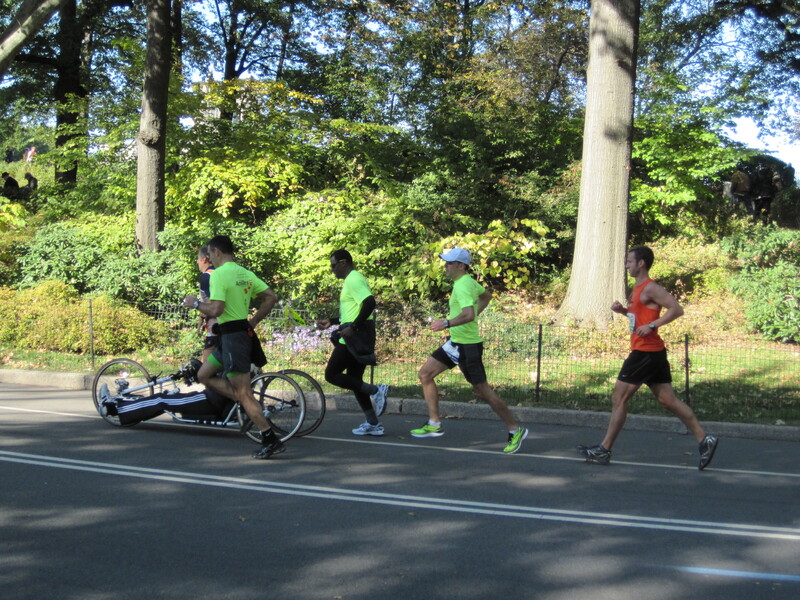 These marathoners who passed (the super first group had already passed) amazed and inspired me to no end. 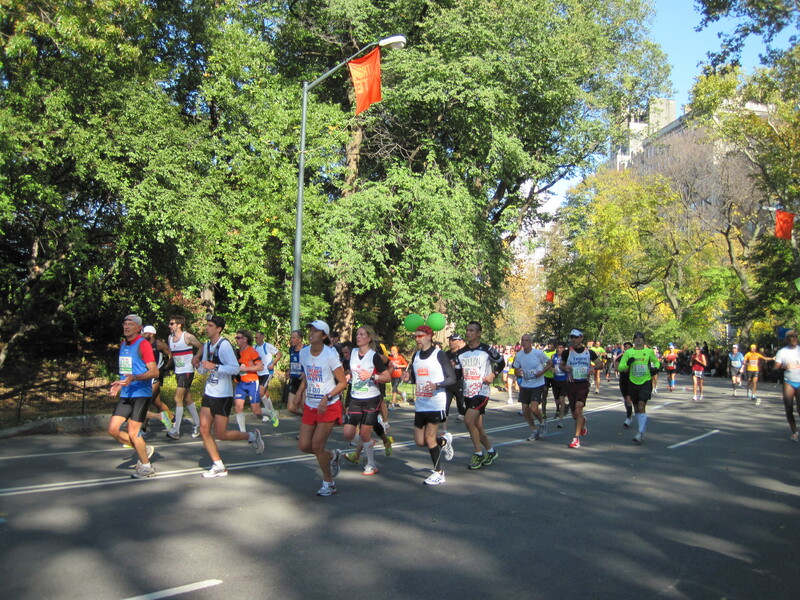 I was so impressed by the people who looked so fresh like they were only on Mile 2. I was super amazed to see people from the beginning again near the end. I admired the ones who were limping along or suffering from pain but refused to stop moving forward however they could. It almost brought me to tears. And laughter. Some of them had so much energy, they cheered us cheerers on! These guys are in AMAZING shape! A new of marathoners wave! Proud to cheer the marathoners! One day, I will be running and I hope you’ll be cheering for me! After watching this race, I know that this is something I must do. See you at the finish line! You’d think I’d be tired after running a 10K with a new PR, playing and performing taiko for 4 hours, and then boozing with Stu. Guess not! 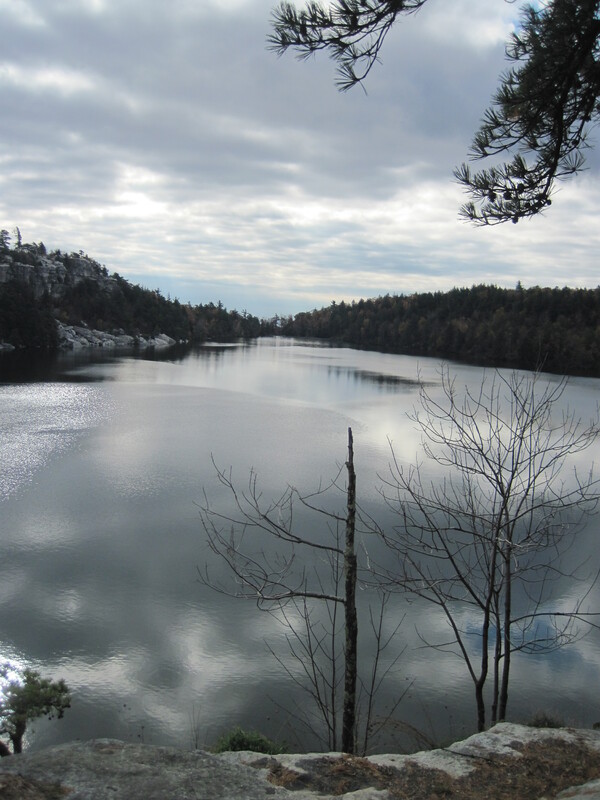 Sunday morning, after 3.5 hours of sleep, I woke up at 5:45am and met up with Shaun to meet up with our group for a birthday hike in Minnewaska State Park. (That’s what I got him for his birthday.) Needless to say, it was gorgeous! 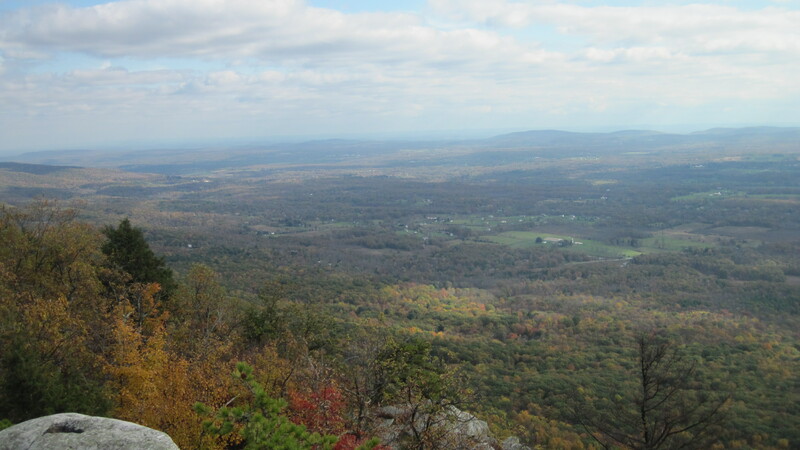 I slept all the way up there, coffee-d up, and off we went hiking into the beautiful fall nature. 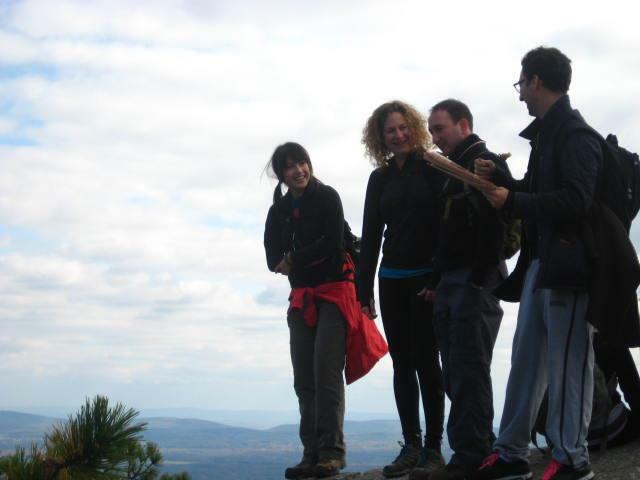 First we hiked down, and then up! 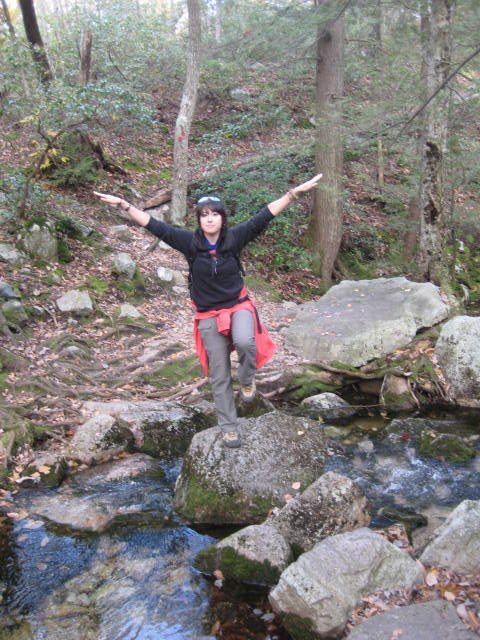 As we hiked down, my knees were a bit shaky but nothing was harder than hiking up the little creek – stone sure gets slippery! Going up on the way back actually felt good – I think my legs got used to the effort, and my ankles got a good workout. All in all, a wonderful day with Shaun! 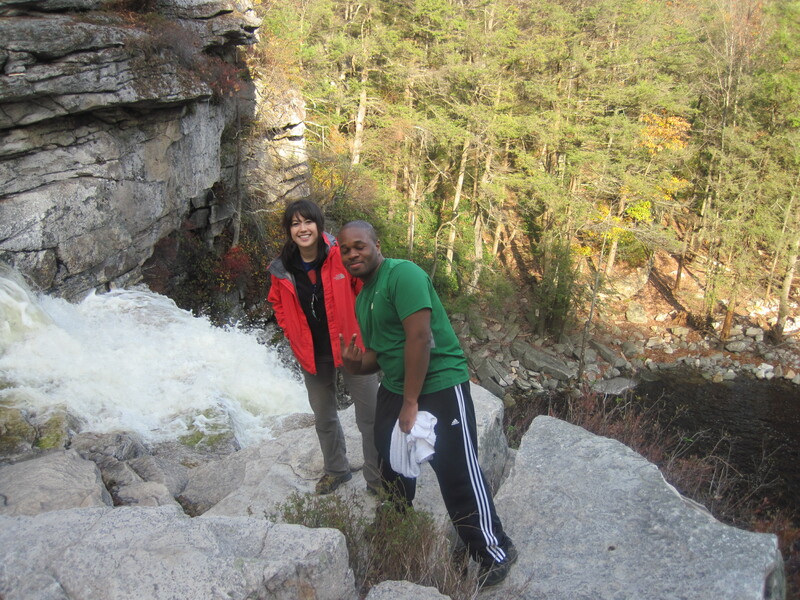 At the end, we got to see Awosting Falls from the bottom...and top!